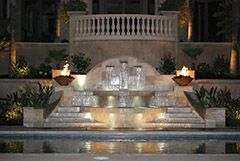 Complete yard restorations with highly imaginative landscape and swimming pool design solutions for your home. We are specialized in partially and completely enclosed cabanas, pool houses and guest houses. 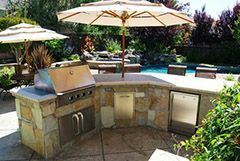 Over 35 years of experience in swimming pool design, construction, remodeling and repair services as well as landscape, pavilions, and BBQs. "Professionalism and down to earth. Their easy to talk with and the presentation didn't compare with anything we had seen prior. We saw what our pool was going to look like in full drawing and architectural plans and that was a big selling point for us". 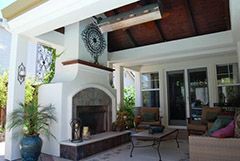 Hawkins Pools provides new swimming pool design and construction services, swimming pool remodel, arbor, BBQs and outdoor kitchen construction, outdoor fireplace and fire pits, landscape, pavilions and cabanas, swimming pool maintenance and repairs. 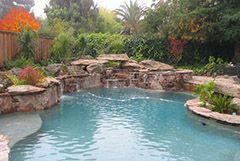 Contact us for new swimming pool or remodel in Alamo, Danville, San Ramon, Lafayette, Walnut Creek, Blackhawk, Orinda, and other bay area cities.